The proposed expansion of the capacity of the Nord Stream gas pipeline in Europe�s north, running from Russia�s Yamal gas fields to the German coast, has split Europe down the middle. Its detractors claim it will make Europe more dependent on Russian gas and give the Kremlin a bigger club with which to bully the rest of Europe. Its supporters say it will diversify routes into Europe, improve energy security and most importantly provide the EU with cheaper gas. Pipelines are always very political, and the politics surrounding Nord Stream 2 are especially fraught. One of its most vocal critics is the US that is threatening to impose sanctions to scupper the project. However, the US has an obvious ulterior motive: it is keen to sell more liquid natural gas (LNG) to Europe, after it became a net producer of gas and has invested billions into LNG ports. From a simple economics point of view piped gas still trumps LNG as it remains between 15% and 50% cheaper, according to various estimates (which are also the subject of vigorous debate). And as the pipes are immovable, piped gas is more secure than LNG, as while Russia can turn the gas off, it shoots itself in the foot if it does so as it has to forgo the revenue if it delivers no gas. Governments don't go to the enormous expense of building gas pipelines they don't intend to use. But putting gas on ships will radically change the nature of the business, as gas will become a commodity traded like oil, and ships, unlike pipelines, can be redirected to whichever market is paying the most for gas at the moment. Poland opposes Nord Stream 2 as it has its own aspirations for an LNG terminal and a pipeline from gas-rich Norway that Nord Stream will undermine. Ukraine opposes Nord Stream 2 as the extra capacity means Russia can effectively cut the Ukrainian transit route through the Soviet-era Druzhba (Friendship) pipeline completely and Kyiv will lose some $3bn a year of income as a result � something the cash-strapped government can ill afford. Russian President Vladimir Putin said openly at Gazprom�s tenth anniversary party that Gazprom was a �tool of foreign policy,� although its role has diminished since then as gas prices fall and Europe diversifies away from Russian gas. Aware of the politics, German Chancellor Angela Merkel insisted that despite Germany�s support for the new pipeline, cutting Ukraine off completely was not an option and Putin promised her that some gas would continue to go through the Druzhba pipeline. But Ukraine remains an unreliable transit route, which is part of the reason Germany supports Nord Stream 2. Russia has cut Ukraine off several times, but always because Kyiv failed to pay its energy bill. In 2006 Russia shut off gas supplies to Ukraine, and hence the rest of Europe because, �It was a force majeure situation. There was a contract and they didn't fulfil it. Its perfectly normal that if a customer doesn't pay for their goods then supply cuts them off,� Russia�s then first deputy prime minister Igor Shuvalov told bne IntelliNews in an interview at the time. While Berlin wants to see Ukraine supported by its Russian gas transit fees for political reasons, it is just as interested in not being cut off from Russian gas again when Moscow and Kyiv are rowing; Russia supplies about 60% of Germany�s gas and going without is not an option for Merkel. And the new route runs directly from Russia to Germany, so Germany�s gas will be cheaper. Another objection is that Nord Stream 2 will increase Europe�s dependence on Russian gas, implying that Russia will send even more gas than now. Having more pipeline routes (Gazprom is also building the Turk Stream pipeline in southern Europe that will eventually form a trident of pipelines from Russia) means supplies to Europe are more diversified, not less, and the demand for Russian gas in Europe is set to rise rapidly. Gazprom�s market power in Europe has already been significantly weakened by the EU�s reform of energy regulations, which has limited Gazprom�s ability to sign individual deals with individual countries. About three years ago Gazprom was forced to renegotiate its gas deals with most of its customers, reducing prices as a result of these reforms. Ukraine�s national gas company Naftogaz just celebrated 1,000 days without importing any Russian gas, receiving it instead from reversed pipeflows from neighbours Slovakia and Poland. However, this is only possible thanks to the EU deregulation as neither of these countries are gas producers and ultimately source most of their gas from Russia. Ukraine is still using the same Russian gas as before, just now it arrives by a more roundabout route � and at a premium. 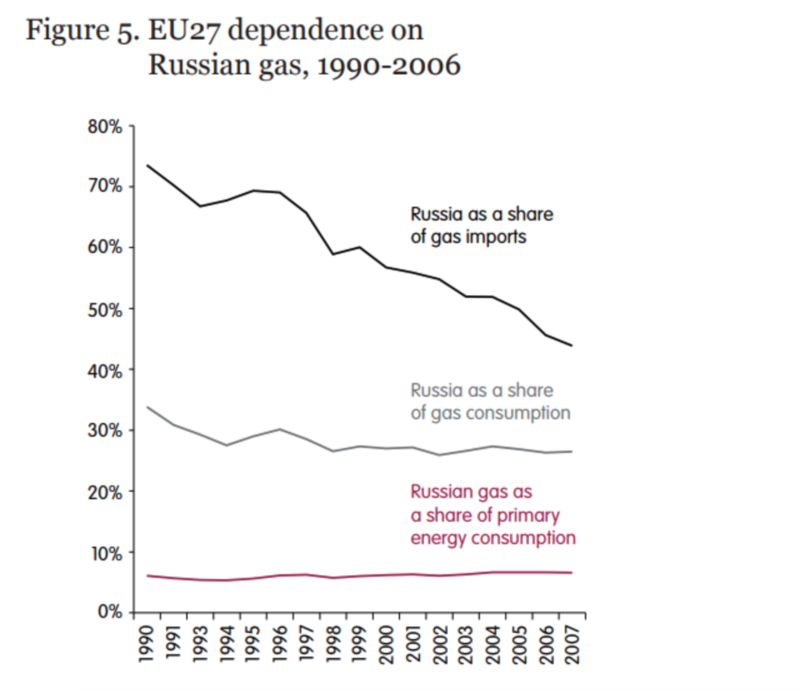 Rather than becoming more reliant on Russian gas, Europe is a lot less dependent. 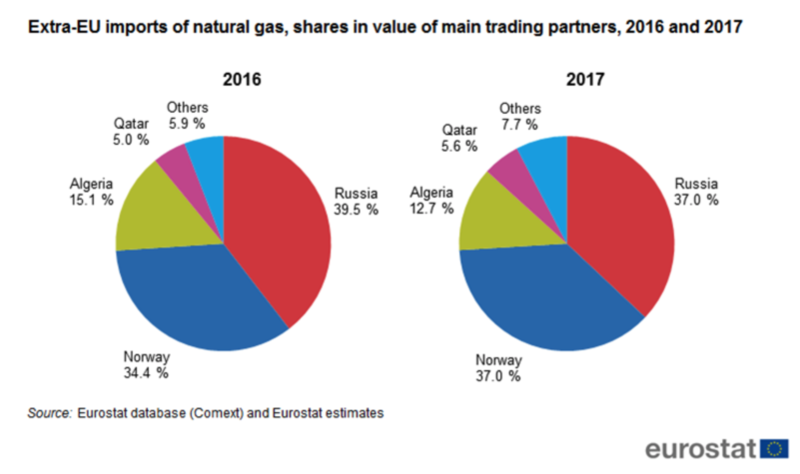 Over the last three decades Russia�s share of gas supplies to Europe has steadily fallen from 75% in the 1990s to 37% in 2017 and continues to fall, despite the fact that Gazprom exported record amounts of gas to Europe this year. "In 2017 Gazprom shipped a record high volume to non-FSU countries (Europe and Turkey) of 194.4bn cubic metres, after 179.3 bcm was exported in 2016," Aton reported on May 4. In January-June, Gazprom�s exports of gas to the EU and Turkey increased 5.7% y/y to 101.2 bn cubic meters (cm). In 2018 exports might reach a record 205bn cm. The rising volume of gas exports has to be set against Europe�s soaring demand for energy, which has risen from about 100 marine gas oil equivalent (Mfoe) to 400 Mfoe over the last three decades, according to the European Council on Foreign Relations. The advent of US LNG and the proliferation of renewable energy alternatives in Europe like wind power will only erode Russian gas�s importance to Europe as an energy source further, but the volume of physical gas Gazprom sends to Europe will continue to increase with demand.